Learn how to create with kraft-tex the rugged paper that looks, feels, and wears like leather; sews, cuts, and washes just like fabric. Designers come together to show you how to work with this exciting new material in this how-to book, which is packed with inventive techniques that anyone can master. Discover endless creative techniques for working with kraft-tex including stitching, embossing, painting, dyeing, embellishing, inkjet printing, washing, distressing, weaving, burning, die-cutting and combine methods for stunning results. 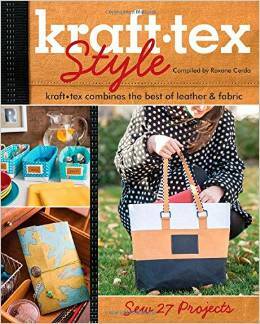 The book includes 27 projects to sew using the 3 colours of Kraft-tex.